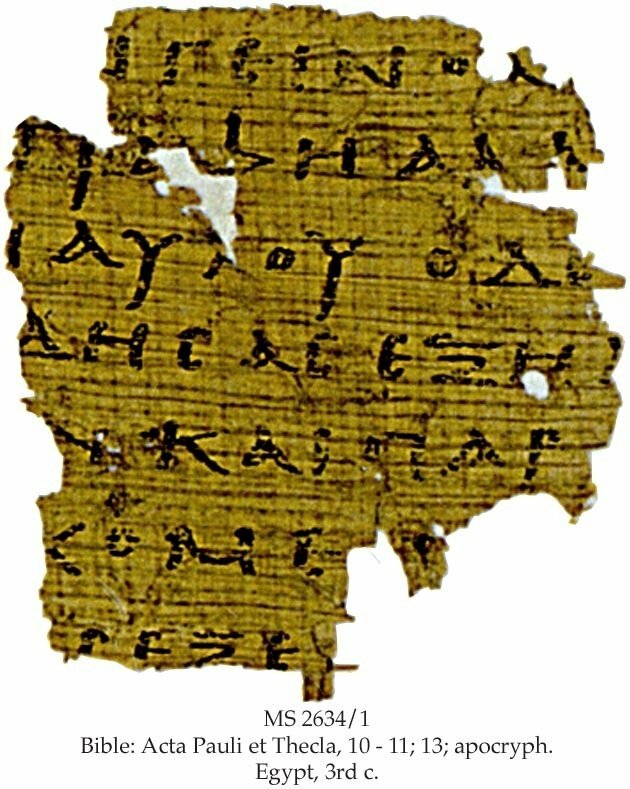 Description	 MS in Greek on papyrus, Egypt, 3rd c., 1 fragment, 4x4 cm, single column, 7 lines (originally 30 lines) in Greek uncial. Context: Found with MS 2634/2 as pastedown in a book cover, Egypt, ca. 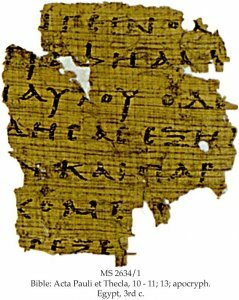 4th c. Only 2 other papyri of the text are known: P. Antin. 13 (4th c.) and P. Oxyrunchus 6 (5th c.). Provenance	 1. Pastedown in a book cover, Egypt (ca. 4th c.); 2. Antiquity dealer, Cairo (1969); 3. Dr. Anton Fackelmann Sr., Wien, Austria, MS 44/1 (1969-1986); 4. Anton Fackelmann Jr., Steyr, Austria (1986-1998). Commentary	 Oldest witness to the Greek Acta Pauli et Thecla. Published	 M. Gronewald in: ZPE 28(1978) pp. 274-275. Exhibited	 Bibelmuseum, Münster, since 1986.